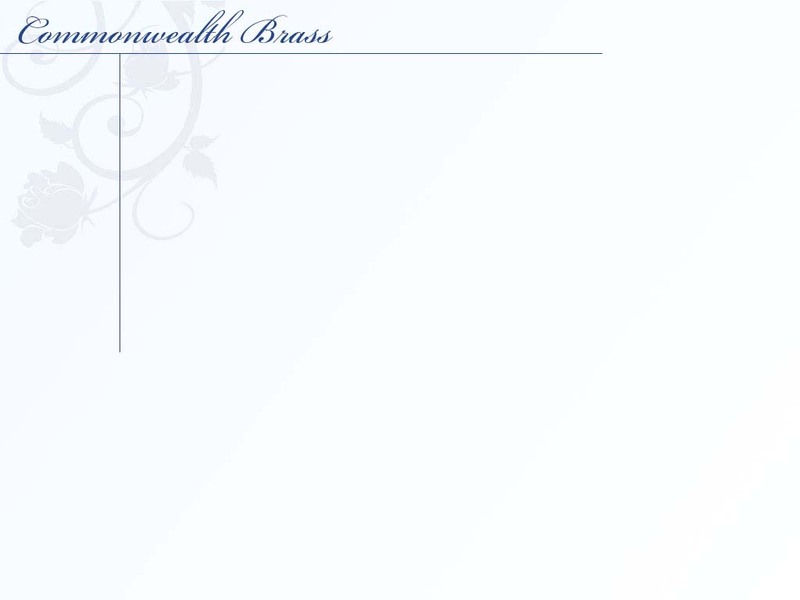 As a group, the Commonwealth Brass has over 175 years of combined musical experience. We have had the privilege, either collectively or individually, to play under such renowned conductors as Col. Arnold Gabrielle, Col. (Ret) Beorgeious, Maj. Arthur W.R. Shettle, Dr. Larry Parsons (Larry Parsons Chorale), Dr. Craig Jessop (Mormon Tabernacle Choir), and Dr. Erin Freeman (currently of the Richmond Symphony Orchestra). Our members have played in venues ranging from small, local churches to the National Cathedral, and the Kennedy Center in Washington, D.C.
Matt Stevens (Trumpet) - Matt has been playing the trumpet for 26 years. He holds a degree in Music Performance from Alderson-Broaddus College. Matt has toured Europe twice, and has even had the privilege to play at Nonnberg Abbey, the setting of The Sound of Music. He has also performed as a soloist for many local area churches, the Chester Brass Quintet, and the European Wind Ensemble of Richmond. He currently plays with the Elbe Musikanten of Richmond, and is the Principal Trumpet in the Richmond Philharmonic Orchestra. Chuck Hinton (Trumpet) - Chuck is a versatile musician with 47 years of musical experience. His musical interests vary from Rock & Roll to the Symphony Orchestra. In addition to playing the trumpet, Chuck also has a talent for arranging music for our brass quintet. He studied under Mr. George Tuckwiller while in college at Virginia State University. In the past, Chuck has played with the Chester Brass Quintet, the European Wind Ensemble of Richmond, the Fort Lee Players, and at the Swift Creek Playhouse. He currently performs with the Unnaturals, a local rock band, and with the Richmond Philharmonic Orchestra. Sandra Burnett (Horn) - Sandra has been playing the horn for 49 years. She has had the privilege to study under Dr. Harold Mintz of the University of Tennessee, as well as Dr. Wayne Pelgram of Tennessee Tech University. She has performed in the past with the Oak Ridge Symphony Orchestra, Chester Brass Quintet, European Wind Ensemble of Richmond, the Petersburg Symphony, the Richmond Philharmonic Orchestra, Glen Allen Cultural Arts Players, and the Fort Lee Players. She currently plays with the Commonwealth Chamber Ensemble (a woodwind quintet), Elbe Musikanten of Richmond, and the Richmond Symphonic Winds. Matt Chafin (Trombone) - A Richmond native, Matt has been playing Trombone for 24 years. Matt is a graduate of James Madison University where he was an active musician while earning his Bachelor's degree, performing with the Wind Symphony and Marching Royal Dukes. Largely self taught, Matt received formal instruction from master trombonists including Mr. Ron Baedke and Ms. Jeannie Little. Matt plays lead trombone with The Richmond Pops Band and The Elbe Musikanten German Band and has freelanced with Ft. Lee Musical Productions (US Army), Richmond Philharmonic Orchestra, and the University of Richmond Symphony Orchestra. Milestone performances include the U.S. Capital Front Lawn Summer Concert Series, the 1997 Presidential Inauguration Parade, and performances abroad in Italy, France, Monaco, and Greece. Matt resides in the Richmond area with his wife, son, and two cats (not to be confused with Chuck who has a wife, kids, and 15 (yes 15) cats). James Nielsen, Jr. (J.J.) (Tuba) - J.J. has 30 years of experience playing the tuba. He attended Liberty University, where he studied music under Bill Folger (Principal Tuba, Lynchburg Symphony). While at Liberty, J.J. played in the Liberty University Brass Quintet, Liberty University Concert Ensemble, and the Liberty Brass Choir. In addition to playing the tuba, J.J. also enjoys the technical side of recording music. In the past, he has played with the Chester Brass Quintet, the Richmond Concert Band, and the European Wind Ensemble of Richmond.